Savory roasted chicken breast strips are sautéed with minced garlic, rosemary, Kalamata olives, bell peppers, and button mushrooms. 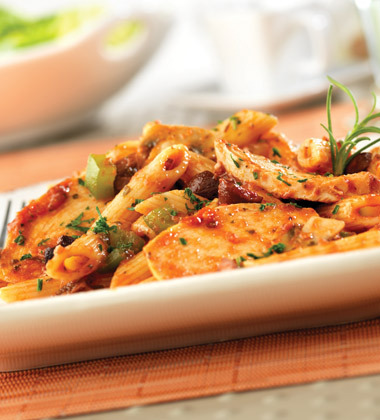 Stir in Prego® Pasta Sauce, toss with cooked penne pasta and top with chopped parsley. 2. Add onion and cook till tender. 3. Add garlic, rosemary, and salt and cook briefly, 1-2 minutes. Do not brown garlic. CCP: Keep all ingredients, except spices, chilled below 40° in display cooking station. 4. Add olives, peppers, and mushrooms. 5. Cook till vegetables are tender, 3-4 minutes. cooked boneless, skinless chicken breast, roasted, sliced	 6 lb. 6. Add chicken and cook till heated through. 7. Add pasta sauce and rotini pasta and heat through. 8. Portion into pasta bowls and top with chopped parsley. CCP: Keep chicken chilled under 40° prior to use and heat till internal temperature reaches 180°. 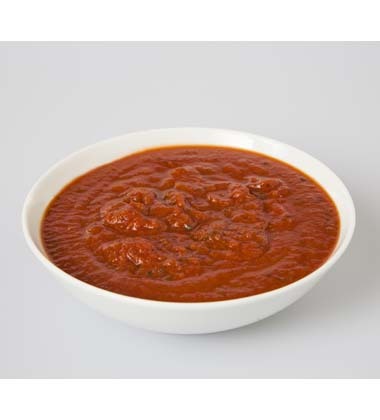 CCP: Heat sauce till temperature reaches 165° or higher for 15 seconds. cooked boneless, skinless chicken breast	 6.25 lb. Try substituting penne pasta for rotini in this recipe.